Meet under Samoa Bridge off Waterfront Dr. These are hi-end electric bikes that can reach speeds of 30 mph. This is a great way to see Eureka’s new Waterfront Trail! No reservations for these rentals, they will be first come, first serve. They are $20 / hour to rent. You can probably cover the entire Waterfront trail in that time. Meet at the Bonnie Gool Dock. An electricity box and wooden water spout structure will be painted and transformed by two local artists. Watch Sierra Jenkins and Kati Texas turn these boxes into works of art! Also, the retaining wall along waterfront drive will have over 15 artists working on their own original murals throughout the day. 1pm: Alme Allen on the trail just North of Samoa Bridge: Meet Alme and hear about how he created a unique piece representing Wiyot Culture. Come build your own handmade paper lantern with SCRAP Humboldt to use for our Light the Night Walk at 8pm! Bring your handmade lantern, light it up, and talk a night walk on the brand new Eureka Waterfront Trail! The Redwood Coast Women’s Chorus is an offspring of The Redwood Coast Children’s Chorus, which began in 1978. We sing for fun – classic, world and folk music in several parts. We perform when it it feasible. The Women’s chorus is open for new members to join starting in October. Please check out their website. The Sundance Ballet Company is planning to premiere a new contemporary dance piece titled, Rococo. Rococo is a dance about the end of the medieval times and rise of Baroque style in 18th-century Europe, with asymmetrical patterns involving court dances and scrollwork. Celebrating the exuberance and theatrical illusions of this era, this new piece by Carrie Badeaux utilizes large stage props that seven of The Sundance Ballet Company dancers skillfully interact with. Also, Kathe will play the celtic harp and will be performing a few pieces during the event. Website. The California Arts Council awarded a $90,000 grant to the Ink People & City of Eureka as part of its Creative California Communities Program. In support of this collaborative project an initiative has been made by The California Arts Council, Ink People, & City of Eureka to represent arts and culture Reviving the HeARTbeat of Eureka’s Waterfront. The grant will be used to initiate a community celebration recognizing the grand opening of the waterfront trail during Eureka Arts & Culture Festival. This festival will take place on Saturday, September 29th from 12pm-8:30pm. The focus of this event is to integrate Eureka arts and culture, and challenge and define local identity through eight uniquely Humboldt interactive benches/sculptures spaced along the length of the Eureka Waterfront Trail. The community will have the opportunity to celebrate the unveiling of the interactive benches/sculptures as one of colorful happenings. The hub of the event with take place at Halvorsen Park where our community will sprinkle throughout the park and trail. 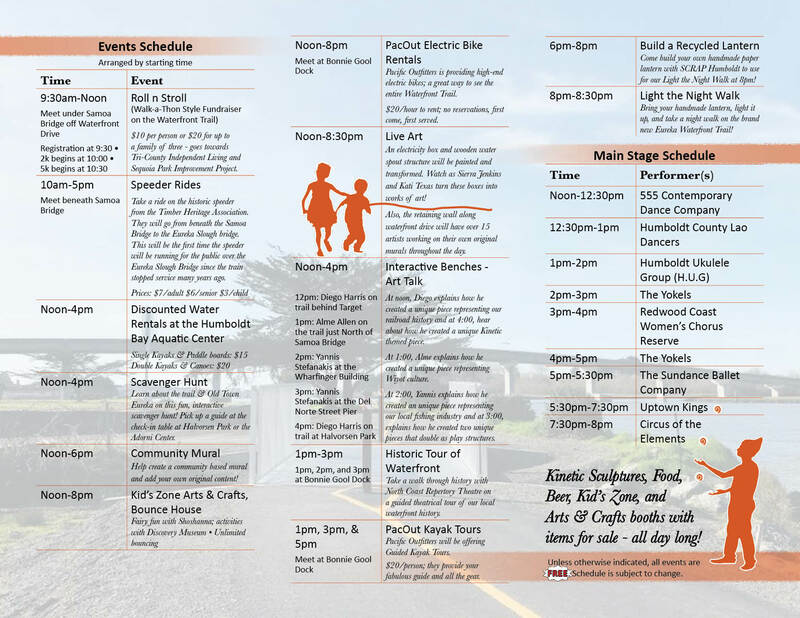 There will be various interactive activities, recreation, art, crafts, and culture that reflect our beloved city, Eureka! The Ink People Center for the Arts is a community-based, grassroots, artist-run, arts and culture organization that changes lives by connecting the community with resources for cultural development. Through the Community Services Department a role of importance has been played the place-making partnership. Community Services has funded the research and development of the interpretive elements which have determined the themes used in the design directive for the place-making project. For further information please contact the Empower Eureka Coordinator at empowereureka@ci.eureka.ca.gov or (707) 441-4248. Are you going to post the performance schedule for the acoustic stage? Thanks for asking. It is posted on this link. Please scroll down. We’ll also be printing up brochures.